BALSAM GHUT, Tortola, VI- As the reality looms that the United Kingdom (UK) might impose ‘direct rule’ on the Virgin Islands (VI) because of demands and letters written by UK appointed Governor John S. Duncan OBE to Premier and Minister of Finance Dr The Honourable D. Orlando Smith (AL) about mismanagement of public funds, yet another UK consultant has joined the Government. Why is he @ Balsam Ghut Prison? UK national Mr Joe Neil has been assigned as a consultant with Her Majesty’s Prison (HMP) at Balsam Ghut, the territory’s only penitentiary. Mr Neil, according to our understanding, will be on assignment for about five months with the right to return after his first five months have expired. He is believed to be working on prison operational matters like needs of inmates, addressing prisoner complaints, building relationship between the inmates and the staff among other things, usually the role of the Prison Custodian Officer. It is unclear who is paying this consultant, who invited him to the Virgin Islands (VI) and what are the new needs of HMP with another UK national David Foot at the helm. Superintendent of Prisons David Foot, Minister for Education and Culture Hon Myron V. Walwyn (AL) as well as his Permanent Secretary Dr Marcia Potter could not be reached for comments up to time of publication. 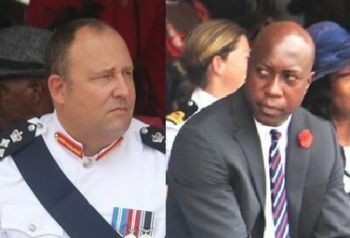 Under Mr Foot’s tenure, the Prison Service has been rocked by fights among inmates, allegations of sexual misconduct, prison escapes, allegations of unfair treatment of prison officers and some prisoners, lack of funds to provide support for the day to day operations and overcrowding. Major portions of the Prison Service portfolio are under the controversial Minister Walwyn. You wicked jkarse, always wishing evil on our people but you don't see those who clandestinely doing so and damning your children nuh? Why we want to get vex with Donald Trump new President, who want to impose direct rule in the US. The UK is about to do the same thing on BVI a white supremacy model, the white man is superior we not saying anything bout that, but we want to kill Trump. More UK consultants are needed to deal with all the problems being created by this government. Bring them in and pay them well for results. With all of the issues at that institution, I hope that he see fit to recommend a complete make over. That's include cleaning out the undesirous staff and have new and meaningful policies put in place and that they are adhere to. If it means bringing in other officers from other jurisdiction on a six months secondment to stabilize thing then so be it. Who paying his salary.? Hope it's England and not tax payers..
who esle but we the poor? who pays for the mismanagement of funds, us the tax payer, so I welcome anyone or anything that is being put in place to safe guard our funds. Narrow mindedness is still alive and well in the BVI. The thing done start.primier it's time to wake up.stop sleeping on the peoples work. All these things are happening under local rule. Did the UK decide to send a consultant, or was it a decision of our own current government? We see who is making the decisions yet we are trying to blame it on Britain. Imagine a consultant to find out if prisoners need toilet paper. If Foot can't do his job he is the one that should be replaced. Indeed, it is this government that should be given a vote of no confidence. We've had enough of their idiotic foolishness. We've seen the enemy and its us. What about the work of the previous consultants that the Minister engaged not too long ago........."This is at least the second time that the government is extending its contractual arrangement with Edwards Consulting, which is based at St. Croix in the US Virgin Islands and is operated by Lesa Edwards and Lew Edwards. The company was initially hired to produce a five-year strategic plan for the local prison system. In August of last year, the contract was extended to enable Edwards Consulting to implement the plan." Is this plan now out of date, we need answers too much wasteful spending it seems!!!!!!!!! Why from UK? Nobody resembling us could do the job? By the way, what colour is he; white, brown or black? All who asking for UK to come in, take a look at the pages of history and see the real way these UK nations treated our ancestors? It in them; they can't overcome the fact that the global warning sun going to kill their tail and we will get blacker and survive because melanin cannot die; they can't get over the fact like Ronnie said, our ancestors built this place with less than a percent help from UK. Come on, people, let us rise up to these no-good, scheming, krakers and tell them govern their Brexit, for as sure as the sun rose this morning, according to Barack, we going VIexit. We are not laughing this time. So bring your pig to this market and hear him go oink, oink. Enough is enough. Can I ask why this has got anything to do with what colour the person is that is coming in for this job. If you can do the job you can do the job, simple. You all ask who is paying the salary, yet you don't seem to mind that millions is wasted or "mislaid" every year by the government. Two examples: cruise ship pier and a recent airline which has still not come to fruition, and yes that was the tax payers money. Everyone no matter where they are originally from, should want an honest and transparent government, that will benefit all. We should be concerned where the workers come from, yes. They come for five months, it turned into five years, then 20, then we got more problems. Can't you see, clearly, one day the numbers are not going to be fudged anymore, but they will reveal the reality of what our grand children will face? Blatant racism. What is happening in America with race will happen here if we don't be careful how we do business. We should plan, plan, plan to always be the Virgin Islands, led by indigenous, not minority groups trying to be majority. Some are so fast asleep they can't see Nebuchadnezzar's handwriting on the wall. If Joe needs me to come out and help i'd be more than happy. He needs to spend money if he is to achieve the results he has been brought in to do. Spend spend spend. If you buy cheap you buy twice in my opinion. I would also like to assure Joe that i will pop into to make sure his mum (sweet baby J is she a good looking woman) is fine while he is away. He'll be mad for it. He'll help build a wonderwall. By the time he finishes they'll be drinking champagne supernovas. Joe will have a masterplan and would be willing 100% to talk tonight. There is no definitely maybe about it, this appointment will bring a rock and roll attitude to prison work. Good luck r'kid.